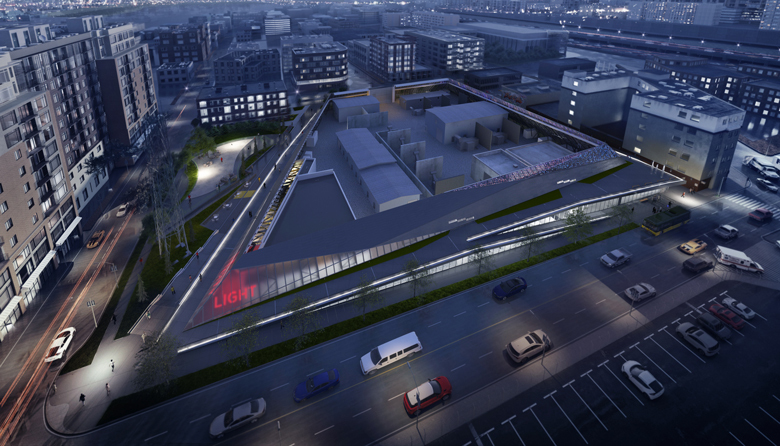 A rendering of the soon opening Denny Substation. This article appears in print in the October 2018 issue. Click here to subscribe. UPDATE 11/27/18: The substation community celebration/grand opening will occur in early 2019. Substations—the electrical distribution networks that power our city—are typically utilitarian in design and hidden from view. But a new substation, the South Lake Union 13kV Distribution Network System known as the Denny Substation (South Lake Union, 1250 Denny Way; 206.684.3000), scheduled to open October 6, is radically different—and a first of its kind for the city—with features and amenities specifically for public use. Designed by the architects at NBBJ (which also created the Amazon spheres and worked on the new Hugo House), the substation—which fills an entire city block—is a community center that includes more than 55,000 square feet of public space, an elevated ADA-accessible pedestrian walkway, a pocket park with an off-leash area for pets, and temporary and permanent art exhibits (including work from Seattle’s renowned Lead Pencil Studio). It’s “a symbol of pride for the neighborhood, City Light, City of Seattle and the natural region that powers the city,” says Scott Thomsen with Seattle City Light, who calls the nearly $300 million addition to the neighborhood part of a “fully developed urban environment.” We think it’s a project that might just illuminate the path toward future city growth.